The entire month of May is National Motorcycle Awareness Month. During this time, campaigns, events and ads will be broadcasted nationwide to help motorists to think about motorcyclists on our roadways to help prevent potentially fatal motorcycle accidents in Boston and elsewhere. According to the National Highway Traffic Safety Administration (NHTSA), there were nearly 4,500 motorcyclists killed in traffic accidents across the U.S. in 2009. Many of these accidents were the result of irresponsible drivers or passengers. This month-long awareness campaign is to help bring road safety and the awareness of motorcyles back to the forefront as the summer ride season gets under way. Our Lynn motorcycle accident attorneys understand that these two-wheeled drivers are extremely vulnerable in traffic accidents. Motorcyclists are not provided with the same kind of protection that you and I are in our passenger vehicles. Accidents involving our two-wheeled friends oftentimes produce fatal results. For this reason, we’re asking all motorists to keep an extra watchful eye out for motorcycles. This is especially important as we enter the summer, as the weather clears up and as more motorcyclists hit our roadways. According to the Massachusetts Department of Transportation (MassDOT) drivers of passenger vehicles, not the drivers of motorcycles, are responsible for nearly 70 percent of car-motorcycle accidents on our roadways. Oftentimes, drivers of passenger cars overlook motorcyclists until it’s too late to avoid a collision. Officials with MassDOT are asking drivers to share the road effectively, to keep an eye out for motorcyclists and to help keep our roadways safe for all travelers. -Remember that because of their small size, motorcycles are easy to overlook. -Consider traffic, road conditions, weather conditions and remember that these conditions can force motorcyclists to react differently on our roadways than passenger car drivers. Allow them with plenty of space to travel as needed. -Check twice before making a move in traffic. Check twice, save a life. -Remember that you’re most likely to get into an accident with a motorcyclist while you are making a left-hand turn, when you miss a motorcycle in your blind spot, when you’re traveling in hazardous road conditions and when you have an obstructed line of sight. -Remember that these drivers have the same rights to the road as you and I. -Be ready for a motorcyclist’s maneuvers in traffic. -Keep an eye on their blinkers. They’re not self-canceling like ours and can stay on well after a turn. For May’s National Motorcycle Awareness Month, the NHTSA is asking drivers to “share the road” safely with motorcyclists and be extra alert for these smaller travelers. 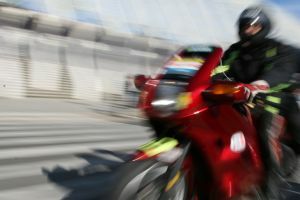 The Massachusetts motorcycle accident attorneys at the Law Offices of Jeffrey S. Glassman, LLC, have nearly 20 years of experience handling serious and fatal motorcycle accident cases and are experienced in representing those who have been injured or killed in a motorcycle accident in Boston and in the surrounding areas. If you or someone you love has been injured in one of these accidents, call 1-877-617-5333 to set up a free initial consultation to discuss your case.